Use high beam headlights at night when there is no approaching traffic. The lights will illumine the eyes of deer on or beside the road. If you see one deer, there are usually others as well. In wooded or farmland areas, particularly where deer crossing signs are posted, decrease your speed and increase your distance from the vehicle in front of you. If you see a deer in the middle of the road, slow down and honk your horn to encourage the deer to move. 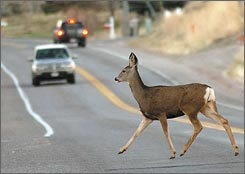 If the deer remains in the road, turn on your hazard lights and wait for the deer to move. Don't swerve to avoid striking a deer. It is better to hit the animal while keeping control of your vehicle than hitting another vehicle head-on, or causing another vehicle to lose control. If you hit a deer and you're unsure whether it is alive, stay away. Deer can inflict injuries with their sharp hooves. Report the accident to your local police or highway patrol.